Look at these great designs and ideas shared with us by our readers. This section is full of onesie cakes. View other designs using the index below. Best of luck with your cake! "Love all of the photos and Ideas! Great site!" 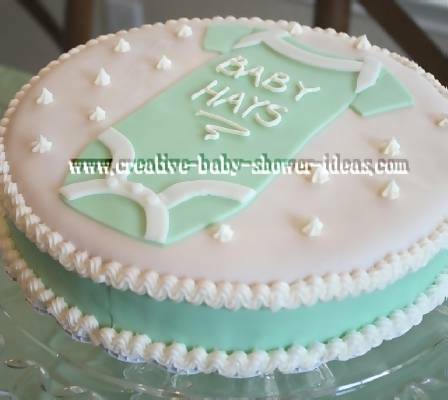 This is an onesie shaped baby cake I made for my best friend's baby shower. I used a chocolate cake mix and covered it with buttercream frosting. I used candy melts to make the dinosaurs in front. I striped different colors in the front to make the onesie look realistic. The arms are cake sections that I cut from the bottom to shape the onesie. This was an easy cake to make. I took a 1/2 sheet cake and cut it into the shape of an onesie. I then used fondant for decorate the cake with strips and added a bib! This was a easy cake to make. 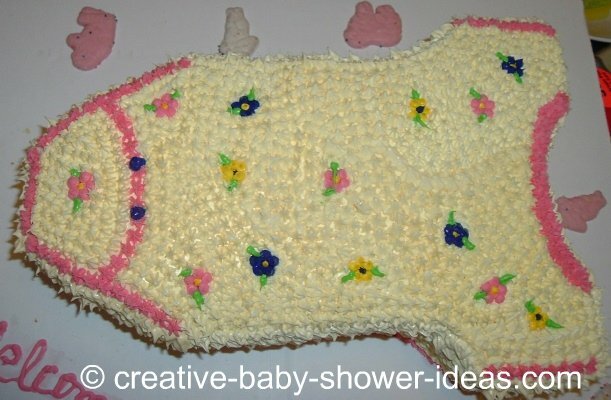 I took a 1/2 sheet cake and cut it into the shape of an onesie. I then used fondant for decorate the cake with strips and added a bib! I made a vanilla cake in a 9 x 13 pan. Then cut into the shape of an onesie. Iced it with homemade buttercream icing. It's basically pretty easy. The flowers and baby undershirt are made from melted marshmallow kneaded with icing sugar. Roll out and I used scissors for cutting. Marshmallow fondant is fun and easy to make and use.